The crystal mine, located on the Randolph Community Forest, was worked by the General Electric Corporation during World War II. Alan Lowe is quoted as saying that GE was hauling ox carts full of crystals out of it for radios as part of the war effort. After the war, and after radio technology had moved on, the mine was blown up, probably a couple of times by various landowners to prevent people from getting in and getting lost or hurt. Hobby gem collectors, however, had discovered a man-hole sized way of entering part of the mine and had been doing so for many years. When the conservation easement, which now governs the uses of land within the Randolph Community Forest, was being negotiated, the Presidential Gem and Mineral Society contacted the forest commission and asked if their right to explore the mine would be protected. As a result, a specific provision allows for non-commercial hobby mineral collecting. Over the last ten years the members of the Society and their guests have used the mine without any problems. They led one of the early Randolph Forest Day tours up to the mine and many of those who went along were able to go down into the mine and enjoy the sight of crystals glittering all around them. 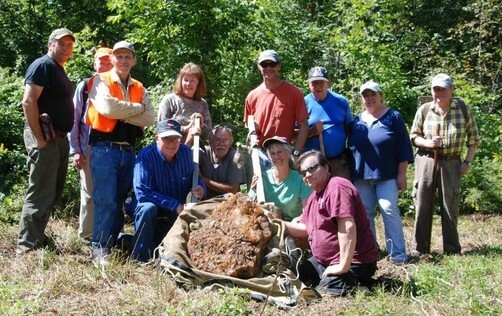 Jenn Barton, John Scarinza, and David Willcox of the Randolph Community Forest are joined by members of the Presidential Gem and Mineral Society, during the recovery of a large plate of crystals that were taken from the mine. Because the mine is located in a secluded spot and not easy to find for someone unfamiliar with the site, the Forest Commission had always assumed that its seclusion would protect it, and, for the last ten years it seemed to do so. But, last summer that all changed. Members of the Presidential Gem and Mineral Society reported serious vandalism at the mine. Someone was ripping off the covering layer of earth and rock and breaking off large plates of crystals, apparently with the aim of selling them. John Scarinza finally caught the perpetrator and he is now charged with breaking a condition of a DRED conservation easement. In light of those actions, the Forest Commission is reconsidering its approach to the crystal mine. Instead of avoiding publicity about it and relying on its seclusion to protect it, the commission will now assume regulatory power to limit access to the mine site, as permitted by the conservation easement. Moreover, if the town designates the site as a “natural area,” which is proposed in the current draft of the proposed amendment, that would attract a state statute which makes it a class “A” misdemeanor to vandalize or deface a geological formation or rock surface which has been designated as such by any of the state political subdivisions. While these steps will not guarantee protection for the mine, without round-the-clock policing, it will provide the town with a better ability to prosecute violators. The Forest Commission also intends to post notices at the mine site, so no one can claim that they were unaware of the rules that will be put into place. The designation of the crystal mine as a natural area was approved by voters at the 2013 Randolph Town Meeting. The full language can be found under the “miscellaneous” heading in the documents section of the web site. This article is reprinted courtesy of the Randolph Mountain View newsletter.